Re-Steel stocks and supplies a full inventory of reinforcing bars that can be used for building construction where it is applicable and acceptable. Bars and components can be ordered with threading and coupling, ranging from #3 (3/8”) to #18. Please refer to our Conversion Table for a bar size designation. The current ACI (American Concrete Institute) Building Code requires billet-steel and low-alloy steel reinforcing bars to conform to ASTM specifications A615/A615M and A706/A706M, respectively. 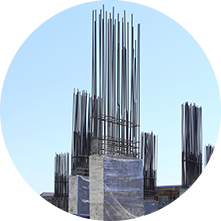 Reinforcing bars conforming to ASTM A706/A706M specifications are recommended for use in seismic-resistant reinforced concrete structures that require controlled tensile properties or for applications that involve extensive welding. Re-Steel has reinforcing bars to fit any of your construction project needs.